Brooks Calbert Robinson Jr. (born May 18, 1937) is an American former professional baseball player. 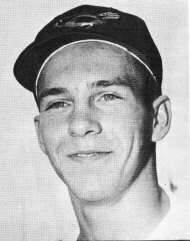 He played his entire 23-year major league career for the Baltimore Orioles (1955–1977), which still stands as the record for the longest career spent with a single team in major league history. He batted and threw right-handed, though he was a natural left-hander. Nicknamed "The Human Vacuum Cleaner" or "Mr. Hoover", he is considered one of the greatest defensive third basemen in major league history.